In the first installment of R.E.A.L. 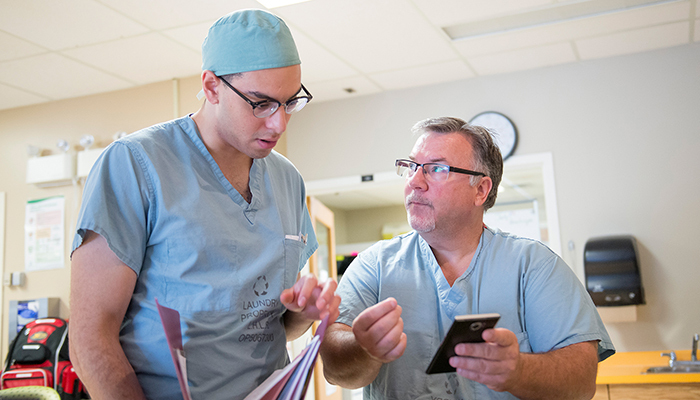 Life Perspectives, we follow faculty member Dr. Robert Black, surgical resident Dr. Kerollos Wanis, and nurse Jackie Moore on the surgical ward at St. Thomas Elgin General Hospital (STEGH). 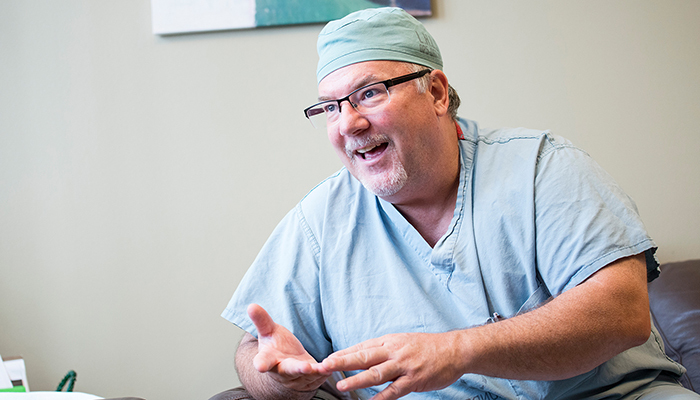 Dr. Robert Black, MD'89, is the Regional Academic Director for the Elgin-Middlesex Academy. 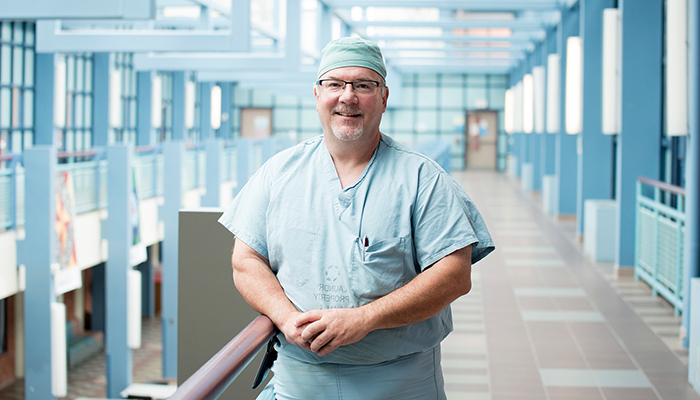 He started working in St. Thomas in 1995, and has helped grow the region's general surgery training program during the past two decades. Dr. Kerollos Wanis is a third-year General Surgery resident with Schulich Medicine. He completed his medical degree at the University of Saskatchewan in 2015. His father is a community general surgeon, inspiring him to also pursue the specialty. Dr. Wanis is currently on academic leave from his residency training in order to pursue a PhD in Epidemiology at Harvard University. Jackie Moore, RN, has spent most of her nursing career working in St. Thomas. As a leader in collaborative practice at STEGH, she mentors, teaches and supports hospital staff. 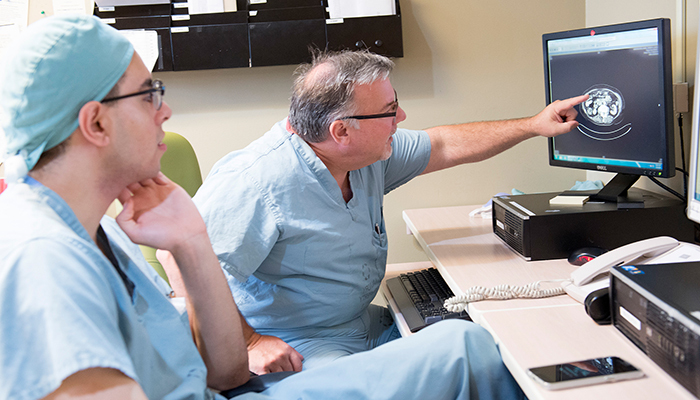 St. Thomas is one of 10 community sites for surgical training in Southwestern Ontario, and part of a network of more than 60 communities in the region where medical training takes place. Through these types of distributed education experiences, trainees gain unparalleled exposure to patients, health systems and health challenges. 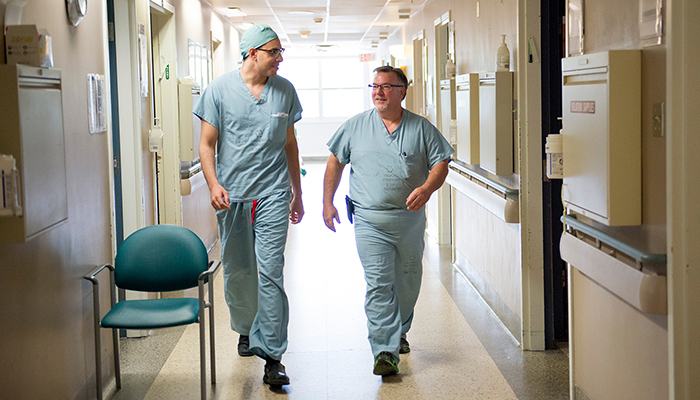 At STEGH, the primary surgical team consists of five full-time physicians. 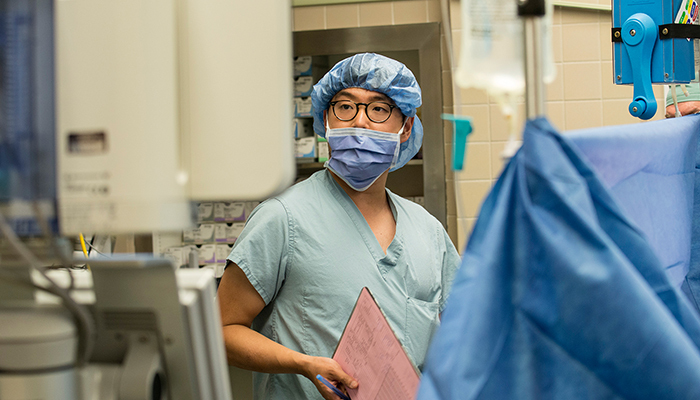 Throughout the year, the team also includes one second-year General Surgery resident completing a three-month rotation and two Family Medicine residents completing one-month rotations, as well as medical students completing observerships and clinical electives. 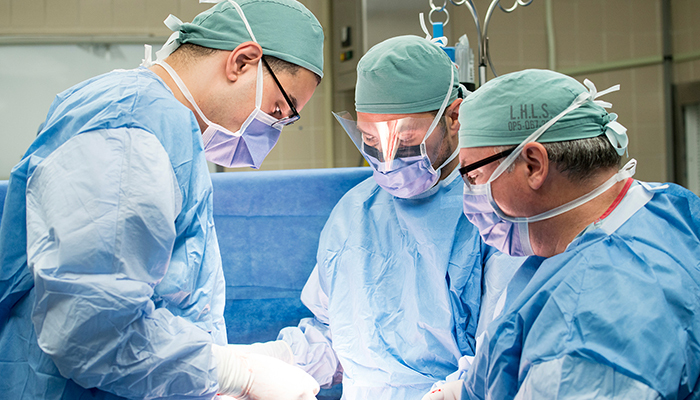 There is a multi-disciplinary approach to patient care, and the surgical team often works in collaboration with specialists in London to ensure timely and standardized care. A typical day on the surgery ward at STEGH includes patient rounds, consultations before surgery and post-operative care. 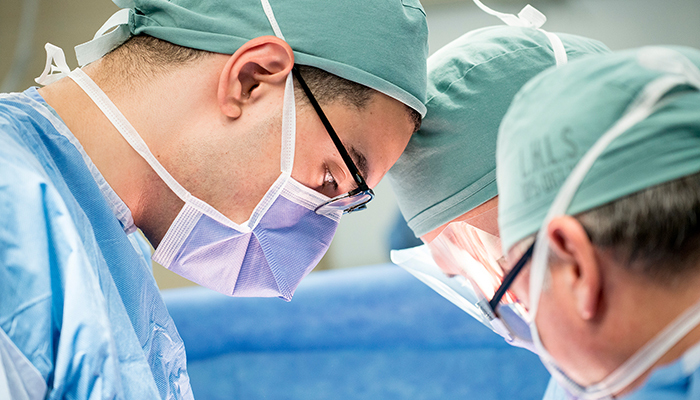 Learners are exposed to a broad range of surgical cases during their experiences and are given more independence in their patient care responsibilities. Thank you to Kimberly Boughner, Dr. Robert Black and the General Surgery team at STEGH for your assistance and support with this project. 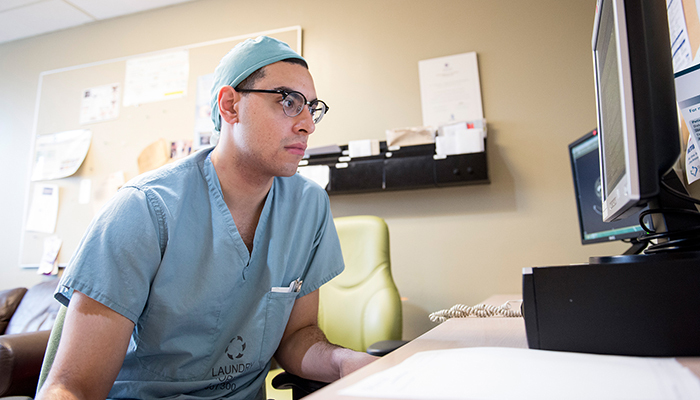 When I was a surgical resident at Schulich Medicine & Dentistry in the 1990s, I had an epiphany – I recognized that half of all surgical residents would end up working in a rural or regional community. And so it made sense for residents to gain community-specific training. The enthusiasm for this type of community exposure and training is now standard in all medical specialties. 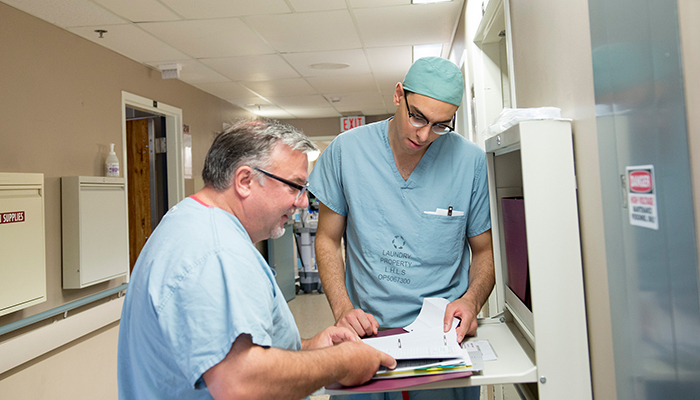 Learners at Schulich Medicine & Dentistry have fantastic opportunities to obtain critical medical training throughout Southwestern Ontario, outside the School’s academic centre. This provides them with the generalized medical expertise and broad surgical skillsets essential for eventual success in community practice. At our distributed site in St. Thomas, learners experience a broader range of surgical exposure, such as hand surgery, gastroenterology, plastic surgery and some orthopaedics. On this particular day, we were working on a cancer-resection surgery. These are cases learners would not have the opportunity to see as part of General Surgery service in tertiary care centres. We also have a large team of five surgeons at STEGH, meaning our service is very busy. Surgeries and scopes take place five days per week, greatly increasing the amount of time trainees can spend practising and honing their skills. Care of surgical patients in the community requires a wide range of surgical expertise and continuity of care. This requires a higher level of collaboration with local primary care physicians, nurses, allied health professionals and specialists in the closest tertiary care centre. During my time as a faculty member, I’ve learned that residents are very keen to practise in a community centre, because of these unique learning opportunities. Many already think of themselves as ‘generalists’, and want to be a part of as many procedures as possible. In the past two decades, I’ve trained hundreds of medical students and residents in St. Thomas. These physicians are now bringing their expertise and skill to the citizens of smaller communities, and elevating care. I consider that to be my biggest accomplishment as a teacher. My experience in St. Thomas was excellent. I had the privilege of functioning as a senior resident, despite being in the intermediate years of my residency. This meant I determined the management plans for surgical patients and took responsibility for their care during their hospital stay. I also had the opportunity to operate every day. As a surgical trainee, I see great value in rural and regional medicine as part of my residency training. The focus of my training is primarily directed at acquiring the cognitive and technical skills necessary to practise as a surgeon, but it is also important to understand the service component of this career choice. 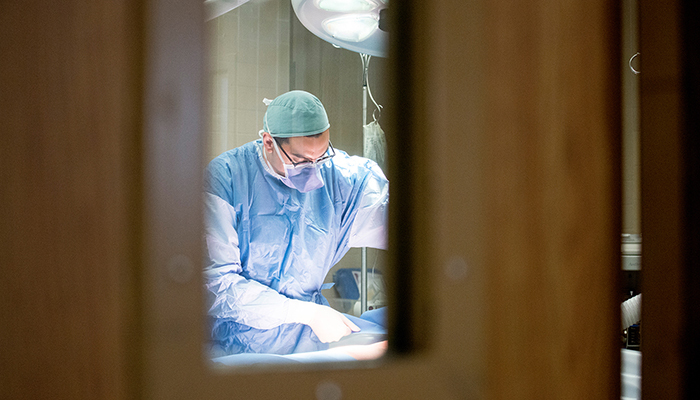 A surgeon’s work is about serving our communities, and the patients and families within them. With the opportunity to work in a smaller community, this service role is easy to identify and appreciate. During my time at STEGH, I was involved in the care of patients whose family members I had cared for earlier in my rotation. At other times, I helped care for relatives of the health care team. 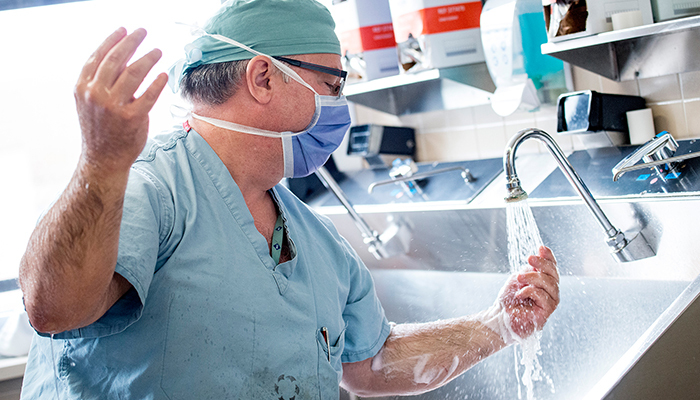 Experiencing this type of setting first-hand reinforced the values of responsibility, professionalism and integrity that are essential to our work as physicians and public servants – particularly in General Surgery, as our job often demands our involvement in difficult and challenging situations. Being part of a smaller community and rural hospital is something very unique and special. On the practical side, learners have the opportunity to be involved in a wider scope of patient care and are given more independence. The staff at STEGH depend on the students and residents, who learn quickly that they have to be dependable, trustworthy and good communicators. The hospital is small; learners need to make a good first impression. 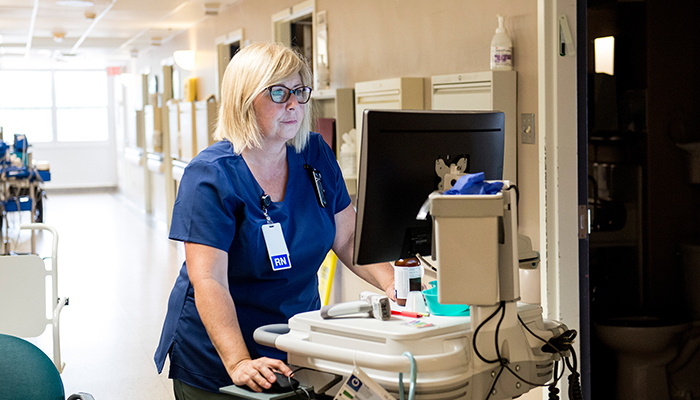 At STEGH, our medical learners come from many backgrounds and learning environments, but this hospital is often a more intimate environment than many have probably experienced in their medical training. There is a true sense of family and community here. In fact, it’s common that one family member is being cared for down the hall from another. Or the health care team may be looking after another team member’s loved one. This type of environment builds character and truly pushes us all to be better care providers. It also results in meaningful work relationships. And in my experience, training in this environment makes a big difference in the type of health care professional each learner will become. Finally, medical education is an ongoing, lifelong commitment – it continues after the degree or certificate. We’re invested in that approach at STEGH and it’s something we impart on the learners as their mentors and teachers.